Daredevils Rock Katy Trail This Weekend! 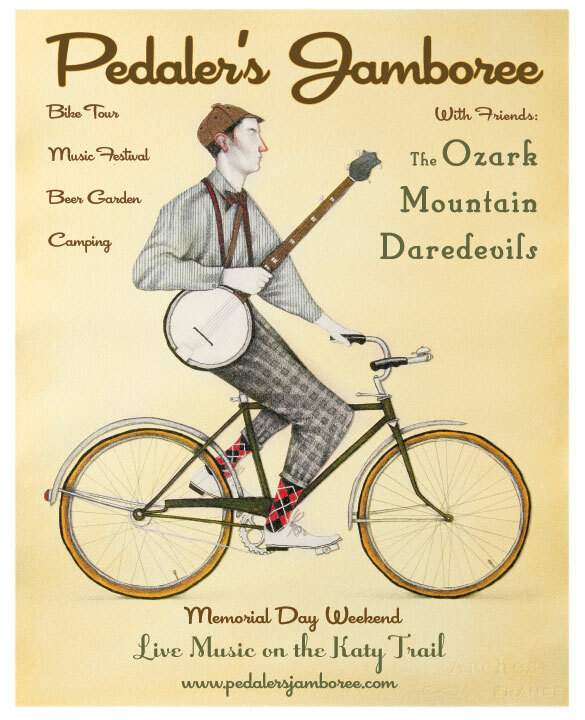 Hometown boys “The Ozark Mountain Daredevils” will headline Pedalers Jamboree this weekend May 28-29, 2011! The Pedaler’s Jamboree is Missouri’s first bike- powered music and camping festival! Welcome in the summer with a slow paced, family friendly, two wheeled celebration on the Katy Trail! With six stages of staggered live music, a main stage party in Boonville and 75 miles of great riding, this is a two day event not to be missed! Check in/registration and departure from Shilo Bar & Grill, 8-10 am. MTK Trail to Katy Trail. Mile 3 = Habitat for Humanity fueling station with free Pop Chips/water/bananas! 6 more miles on MKT to Katy Trail. Stop at your leisure. Take a right turn at Katy Trail. Depart Boonville at your leisure and return east on the Katy Trail. Travel back to the Katy & MKT trailhead and back to Columbia. In the early 1900’s Strawberries were shipped from Monett all over the U.S.A. from the railroad, just one block south of Broadway. With that extensive history, and the fact Strawberries are in season in early June, Monett is presenting a sweet fun Festival. The attendance to the Monett Strawberry Festival is free to the general public. All events are accessible for people with disabilities. There will be local bands and musicians playing during the day on the stage at the east end of the 400 block of Broadway. There will also be performances by Captain’s Son, Angela Bennett, Robert Pommert and The Bootkickers. All music events are free to the public. A play about the history of Strawberries in Monett has been written, and will be performed each evening. There will be a “Talent Show” each day, featuring acts of all kinds, from dancing and singing to juggling, it’s open, as long as it is “Family Friendly”. A Karaoke Contest will take place on Saturday. A “Petite” Strawberry King and Queen will be crowned at the Strawberry Festival. Children from infants to 5 years old can enter. In April and May we will be having contests for Grade School, Middle School, and High School students for Poetry, Prose, Songs and Posters relating to Strawberries in Monett. The winners will be showcased on stage during the Festival. There will be a Cruise In Car Show on Saturday. The public will get to vote for their favorite cars, trucks and motorcycles in “Decade” categories. Friday and Saturday there will be an Art Show in one of the stores on Broadway. This art show will feature Children, Teen, and adult categories. This will include Paintings, drawings, wood carvings, sculptures, photography, and “Other Media” catagories. There will be a contest for the best Strawberry Preserves, Jams, Pies, Cakes, Cookies, and any other Strawberry related foods, as well as best “Non-Strawberry” Berry foods. This will be simular to the old County Fairs. There will inflatable kid’s rides provided by the Fun Zone from Cassville. There will be a charge for these rides. There will Craft Booths, Food Booths, and Non-Profit Organizaing Booths. For information. Our goal is to bring a fun event to Monett that is as refreshing as a step back into the past and relaxing as well as entertaining. Come downtown, eat some strawberry ice cream or maybe some strawberry shortcake, enjoy the show. It’s Bluegrass Tuesday with Bill Monroe! This year marks Bill’s 100th Birthday, Festivals are planned throughout the year in celebration…For more info on visit the link below. Bill Monroe was born on Sept. 13, 1911, in Rosine, Ky. Credited as “The Father of Bluegrass,” the music he created evolved from the folk and country music he heard growing up in a musical family as the youngest of eight children. As a child, he also backed up his uncle Pendleton Vandiver (“Uncle Pen”) at local dances. In 1938, the highly successful duo split up, and Bill formed his first band, the Kentuckians. A year later Monroe changed the name to the Blue Grass Boys and soon set his sights on Nashville. Monroe was only 28 years old when he joined the Opry cast on Oct. 28, 1939. Introduced by George D. Hay, the Opry’s founder, Monroe performed a the Jimmie Rodgers hit “Muleskinner Blues” and got three encores that first night at the War Memorial Auditorium. He quickly became an Opry favorite. By the 1950s, Flatt & Scruggs emerged as a formidable presence, while Monroe continued to play the Opry. However, by the 1960s, folk music had become popular, and promoter Ralph Rinzler helped return Monroe to the spotlight. In 1965, Monroe headlined the first multi-day bluegrass festival, and he inaugurated his own annual festival in Bean Blossom, Ind. Monroe was inducted into the Country Music Hall of Fame in 1970, and he earned the National Endowment for the Arts’ esteemed Heritage Award. His Southern Flavor LP won the first Grammy award ever given for bluegrass music in 1989, and he earned the Grammy’s Lifetime Achievement award in 1993. In 1995, he was awarded a National Medal of Honor by President Clinton at a ceremony conducted at the White House. Monroe died on Sept. 9, 1996. A year later, the Rock and Roll Hall of Fame inducted him as an early influence of rock ‘n’ roll. A number of prominent bluegrass musicians also spent time as one of Monroe’s Blue Grass Boys, including Stringbean, Mac Wiseman, Jimmy Martin, Sonny Osborne and Del McCoury.